Not only a man with four eyes and four pupils but the one who created the written language in China about 4000 years ago. Legend has it that Cangjie worked for the Yellow Emperor who ordered him to find a new way to count his livestock. To cut a long story short Cangjie took his inspiration from different animal footprints, i.e. every animal has a unique one and so symbols were used to represent different things. 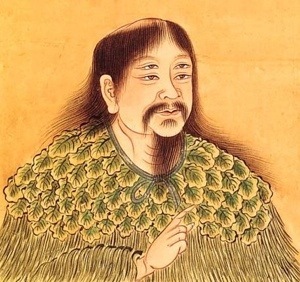 On the day that Cangjie had his Eureka moment grains of millet rained down from the sky in celebration but ghosts cried during the night believing that it would lead to deceptive and deceitful behaviour. 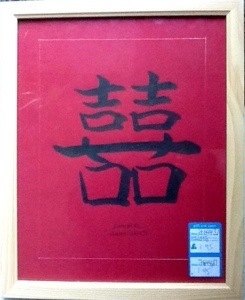 This next original picture has upon it the symbols that represent Double Happiness. It was created by Shao-Cheen Laine. It only cost £1.95 which isn’t much to pay for double happiness.